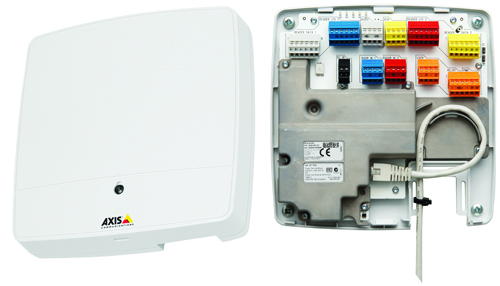 Axis Communications recently launched its first product for the physical access control market. The unit is a two-reader (one or two door) controller providing all the necessary inputs and outputs for the usual door monitoring, request for exit and locking functions. Power to the unit may be PoE class 3 or 10-30VDC. The A1001 may be used standalone or up to 33 may be networked. No additional software is required; the unit may be controlled from any PC on the network via its onboard access management software package (AXIS Entry Manager). Out of the box, the A1001 is an innocuous looking square white unit with a single screw securing the lid. Removing the lid however reveals a sensibly laid out product with colour coded pluggable terminal connection blocks. There is a cut-out in the back plate for cable entry and whilst there is not a huge amount of room, the unit provides sufficient space for wiring (assuming this is done in a tidy manner). The unit may be mounted using the four holes in the back plate or via DIN rail (not supplied). Front and back tamper switches are provided and there is a pair of links to the top right hand side of the PCB to override each of them if required. The overall build quality is good and all terminal connections are easily accessible. Shielded twisted pair cabling is recommended for the network connection. The A1001 may be configured for read in, read out operation of a single door or read in only on two doors. The controller is compatible for use with most wiegand format readers and a range of RS485 readers. Our testing with the unit was completed using 26-bit wiegand format cards and readers. Connections to the controller are straightforward once you have a connection diagram. If using PoE only to power the unit, the auxiliary output is limited to 7.5W for readers and lock so this pretty much limits the controller to use for a single door and care needs to be taken with lock selection. To make the most of the controller’s functionality therefore, use of a battery backed 10-30VDC supply should be considered. A quick installation guide (of illustrations) is the only documentation provided with the A1001, there is not the usual CD which we think is a mistake. Lots of illustrated detail on how to mount the unit and running cables but minimal detail on getting the unit operational or even connecting it; information on the latter is only available once you are logged into the controller. If you are familiar with Axis cameras, discovering the unit on a network and logging in isn’t a problem but this assumes you already have Axis IP Utility software and know the default username/password as neither is provided with the product. The controller is set to DHCP on power up but will assume a default IP address (stated in the quick installation guide) if no DHCP server is found. Providing there is no DHCP server, accessing the onboard software is a simple matter of web-browsing to the default address. Once you have connected to the unit and logged into Axis Entry Manager, navigation is reasonably straight forward and a printable connection guide for the controller finally becomes evident. Door hardware configuration is completed via a short wizard within the setup area of the software and there is also a connection verification option enabling connections to be tested. Within the Access Management tab there are the usual configuration options for adding users, access groups and time schedules. These were reasonably easy to configure and as each step is programmed the software provides prompts the user with anything that’s missing. User card numbers may be input directly or retrieved from a card reader (this is a little unusual in that you retrieve the card number after you’ve offered the card to the reader rather than before). The software certainly isn’t difficult to use although some configuration elements may become somewhat tedious to complete if there is any significant amount to do. Alarm and event logging is provided within the software but we could see no way of monitoring live events. The hardware is of good build quality and easy to install. If working with multiple door controllers, data should be synchronised between them automatically, although we were unable to check this. Axis Entry Manager claims to provide an access management solution for small to mid-sized applications but we feel the lack of breal time monitoring is a limiting factor when you consider it could be used to control in excess of 60 doors. The product does however have one major advantage: – with its open IP architecture; it provides an ideal hardware platform for SMS providers to integrate with and indeed several of the major players have already done so.